WARNING: Long post ahead! I had a few people ask me to tell my birth story, and I figured I'd go ahead and do so. I am still working through all of my feelings from how my birth went, so this story is sort of a work in progress. Monday, April 5 was my first day of maternity leave. I was 37w6d. In the early afternoon, I started feeling contractions that felt different from the Braxton-Hicks ones I had been having. They were super irregular, though, so I didn't really think much of them. I told Cecilia, "You need to wait, baby, Dr Dean is out of town until Wednesday!" Like so many other things with my girlie, she had her own ideas on the subject! When Chris got home from work around 5:30, we went for a walk. During that walk, the contractions definitely got stronger, sometimes strong enough that I had to stop for a second, or strong enough that I could keep walking but didn't want to talk while they were happening. Still, though, they were very irregular in length. I thought to myself, "There's no way you're in labor, you're a first time mom and you're two weeks before your due date." So I kept on carrying on like normal when we got home. By 11 pm the contractions were much more regular, around 4 minutes apart, and lasting from 30-90 seconds. We finally decided that we should go to the hospital and see if I was truly in labor. Let me back up for a minute here. Early on, when I first learned that I was pregnant at around 5 weeks post conception or 7 weeks pregnant, I had my first great disappointment: I risked out of the birth center because of my diabetes. So I knew all along that I was going to have a hospital birth. 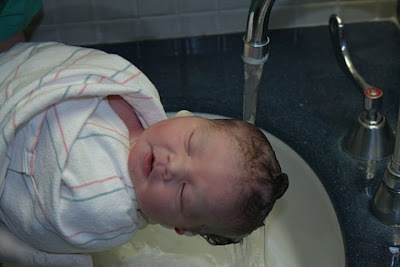 I wasn't thrilled about it, but I had an OB who was very natural-friendly and supportive of my efforts to have a natural childbirth, and who agreed with my "crunchy" birth plan. OK, so we went to the hospital (TMC) and I was checked into a little triage room. By the time we got our crap together at home and got there, it was around 1 am. The nurse hooked me up to the monitor and very quickly determined that I was indeed having REAL contractions and was in active labor. OH THE EXCITEMENT! We hadn't told anyone yet, because we didn't want to get everyone out of bed for a false alarm. But here we were, with the real thing happening! I went to the labor/delivery room with Chris and got settled on the bed there. We called my sister and my parents and Chris' parents, and let them all know what was happening. The pain from the contractions was getting intense, but was still very manageable with my breathing exercises from Bradley class. We were so excited, so happy, so thrilled to be there and finally be meeting our little girl. In the midst of all of our happiness, the first unhappy moment came to us. The nurse came in to take my blood pressure, and I saw the look on her face and knew we had a problem. My blood pressure was very high, to the point that they were worried about pre-eclampsia or me having a stroke right then and there. The OB from my OB's practice who was on call came in and talked to me frankly. She said that I needed to get an epidural even though I wasn't planning on one, because a spike in blood pressure is often the body's reaction to pain, and getting an epidural would lower my blood pressure. Chris and I talked about it for a minute and agreed to get the epidural, even though I felt like I was managing my pain. Still, we were scared with blood pressure so high, so we agreed. I got the epidural, and it went really well. It wasn't so strong that I couldn't feel my legs or anything; mostly it felt very much like pins-and-needles when your foot falls asleep. The pain from the contractions was totally gone. Unfortunately, this didn't bring my blood pressure down quite enough. I was given a couple of blood pressure medications, one of which was magnesium sulfate. Mag sulfate is a heavy duty medication. When a woman has that, she has to stay in bed for 24 hours after the mag is delivered, because it makes you very weak. It also makes you nauseous. Speaking of nausea: By this point it's around 3 or 4 am, my sister and parents are there with us, and I am starving. I hadn't had anything to eat since dinner the night before. But I was a big C-section risk because of the blood pressure and so I wasn't allowed to eat. OH MAN was it hard. I was getting so lightheaded and nauseous, although it was hard to tell if that was from the lack of food, the mag, or both. Anyway, time goes by fairly quickly. My in-laws came as well. I could still feel all the contractions even though I couldn't feel the pain. By 10 am I was 7 cm dilated and 100% effaced. My bag of waters was still intact, and so Cecilia was still a bit high up, like -2 station. By this point the OB on call was a different one than the first one, but still from the same practice as my OB. She came in and asked me if I was ready to have my water broken, so that I could finish dilating and get things moving. Her big concern was still avoiding the emergency C-section that might result if my blood pressure went up again. We agreed, and once she broke my water, I dilated the remaining 3 cm in about an hour and a half. Around 12 or 12:30 I was ready to push. I asked for a mirror, and it was brought over for me. I had my mom supporting my neck, and my husband and sister each supporting a leg. I pushed and pushed and pushed. Over the course of two hours, I pushed and got Cecilia almost completely crowned. It was crazy; I was so tired and hungry and lightheaded that I slept between pushes. I remember hearing the nurse say, "Hey, if she can get some rest, leave her alone, guys. She needs it." Then, all of a sudden, something happened that I had never even considered. My contractions started disappearing, with Cecilia still in the birth canal. They just...dissipated, there is no other word for it. By this point most of my epidural had worn off and I could feel them slowing down and going away altogether. What I learned later on angered me a lot: mag sulfate is often given to women going into premature labor. It is used to stop contractions as well as lower blood pressure. I told the OB that my contractions were gone, and she confirmed it on the monitor. She came to my head and told me that I had two options: She could cut an episiotomy and use the vacuum hand pump to bring Cecilia's head out of the birth canal and finish delivering her that way, or I could have a C-section. I went with door number one, of course. With one snip and a very quick application of the vacuum, since Cecilia was already mostly crowned, my sweet girl was born at 3:18 pm exactly two weeks before her due date. Because she had been in the canal for a couple of hours, the NICU doctor wanted to check her out and make sure everything was okay, so her cord was cut very quickly (I was pretty sad over this). While she was being checked out and weighed and measured, my episiotomy was sewn up. It was very quick on both accounts; within minutes, I had Cecilia in my arms. Chris and I both cried and cried, and I think just about everyone else in the room did too! The most amazing part was how phenomenally alert Cecilia was. I was afraid I was going to have a lethargic, drugged baby from all of the medication I was given, but it didn't turn out that way at all. She looked up curiously at Chris and I crying, and made eye contact with both of us almost immediately. She seemed to be drinking in everything around her, just looking from person to person and at all of the stuff she saw. This, by the way, has never changed-- Cecilia's favorite pastime outside of the house is to watch everything. Tiny miss' birth stats: 6 lbs 3 oz, 18.25" long. A petite little one! I will continue my story of our postpartum time later. I think this is enough of a story for now, don't you?? Chris and I both crying over the joy of our sweet girl being with us finally. awwww! Thanks for sharing! I'd never heard of someone's contractions stopping before - until it happened to me. It's interesting to hear your story. Thank you! I had never heard of it either!! Were yours due to medication too? No, actually it wasn't. I had a homebirth with no meds. I tried googling something about contractions stopping during labor, but must not have used good keywords because I got nothin. :) I would be curious to know more about it! It must not be all that common?